This map displays territory of Jordan, of Syria. Displayed large city Az Zarqa' for Garmin. city Russeifa for Garmin. Displayed city Ar Ramtha download for free. 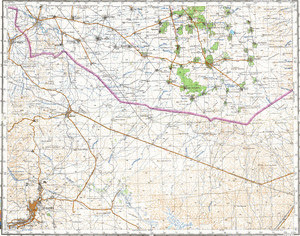 On this map city Al Mafraq presented. You can find here town Al Hamra' for Garmin. You can find here town Sabha marked. town Umm al Qittayn for Garmin. town Busra ash Sham marked. You can find here Rasm Kawm Kuqayd download for free. On this map Quwayris marked. You can find here Mazra`at an Nimr presented. Displayed Khirbat Ruhayyah download for free. Khirbat Qamra for Garmin. Displayed Khirbat Junf marked. You can find here Khirbat Dubaybinah download for free. Khirbat al Mushrif for Garmin. You can find here Khirbat al Manarah download for free.